"When food blogger Anya Kassoff moved from Russia to the United States, she had to learn to cook with a new kind of seasonal produce, like asparagus, avocado, and a variety of leafy greens. Her cookbook, Simply Vibrant, showcases a love of eating with the seasons she’s since refined into vibrant, nourishing food that epitomizes the all-day-cafe ethos. From alt-grain porridges and khichari to daikon radish pad thai noodles and sippable barley water with ginger and citrus, Simply Vibrant captures the kind of accidentally-vegetarian food we want to eat right now. "In her delicious interpretation, Kassoff leans on her Russian heritage to bring a secret flavor bomb to the table: prunes. But wait, they’re not just any prunes—they’re prunes soaked in fruity, sweet-tart balsamic vinegar, to really make the dish sing....And what a tasty result it is. Earthy portobello mushrooms step in to provide that meatiness, and the soaked prunes round out the tart tomatoes and pair well with the umami-rich tamari, which all give the pasta depth. "Simply Vibrant author and Golubka Kitchen blogger Anya Kassof shares a recipe for her go-to meal this time of year: a healing squash and chickpea soup. “I make it everytime I or anyone in my family starts showing any signs of a cold coming on,” says Kassof. “I really believe in its powers, since I’ve watched myself and many of my friends and family get immediate cold relief from drinking the broth on numerous occasions." "Have you tried black bean hummus? It’s delicious on everything from carrots to chips, but especially burritos. So, to continue our month of vegetarian dinners, we’re sharing the recipe for these smoky cauliflower burritos made with the savory spread. Anya Kassoff, author of the new cookbook Simply Vibrant, shows us how it’s done …"
"Grab nature's most photogenic citrus fruit and whip up this obsession-worthy topping for every occasion this month. These vanilla-infused candied kumquats make a bright, punchy and antioxidant-packed addition to salads, desserts and breakfasts –just the fresh spring vibe we need to pull us out of the winter doldrums. The brilliant mother/daughter duo behind this recipe, Anya Kassoff and Masha Davydova first launched their stunning blog, Golubka Kitchen as a way to share homemade recipes with each other. Their new Simply Vibrant cookbook — a follow-up to The Vibrant Table — is full of clean, seasonal dishes we could easily eat every day…"
"In her latest book, Simply Vibrant, cookbook author Anya Kassoff shares a rich, filling enchilada recipe that showcases cold-weather vegetables. Loaded with roasted sweet potatoes and robust collard greens, Kassoff has created a dish that’s both comforting and balanced. Like all enchiladas, it takes a bit of time to make the components, but the dish will keep in the fridge for up to five days, so it’s an ideal make-ahead meal to then enjoy throughout the week." "Vegan, vegetarian and gluten-free tomes make up the bulk of cookbooks that arrive at the Star nowadays. While more options are always great for home cooks, I find many of the authors have restricted themselves to MacGyver-ing comfort food dishes by subbing out essential flavours and textures. The result is often a flavourless and overly complicated version of the original. So what made me want to cook from Simply Vibrant, the second vegetarian cookbook from mother-daughter lifestyle bloggers Anya Kassoff and Masha Davydova of Golubka Kitchen, is its more relaxed approach to plant-based cooking. "There isn't much a sweet potato can't do. Thanks to this recipe from new cookbook Simply Vibrant, that includes acting as a vehicle for plenty of dark chocolate. But that doesn't mean you'll mistake these for dinner—the mother-daughter team behind popular blog Golubka Kitchen makes sure these brownies are all dessert, with a nutty vibe from ground hazelnuts, plus almond flour and butter." "I love this Simply Vibrant cookbook. It's vegetarian and plant-based. It's colorful, with a whole variety of meals. You can start off with Superfood Summer Porridge... During the winter, colorful Winter Bowl, Oven-Baked Latkes, you're not standing over your stove making these. And to finish, Sweet Potato Chocolate Brownies. There's something for all meals, they are inventive, they are inspiring, and seasonal." "Bringing the heat to your vegetarian dining game for the next few iced over months is as easy as picking up a copy of Anya Kassoff's Simply Vibrant. The bright, plant-based cookbook is overflowing with warm and imaginative seasonal recipe magic — from savory sweet potato dumplings to hearty black bean hummus burritos." 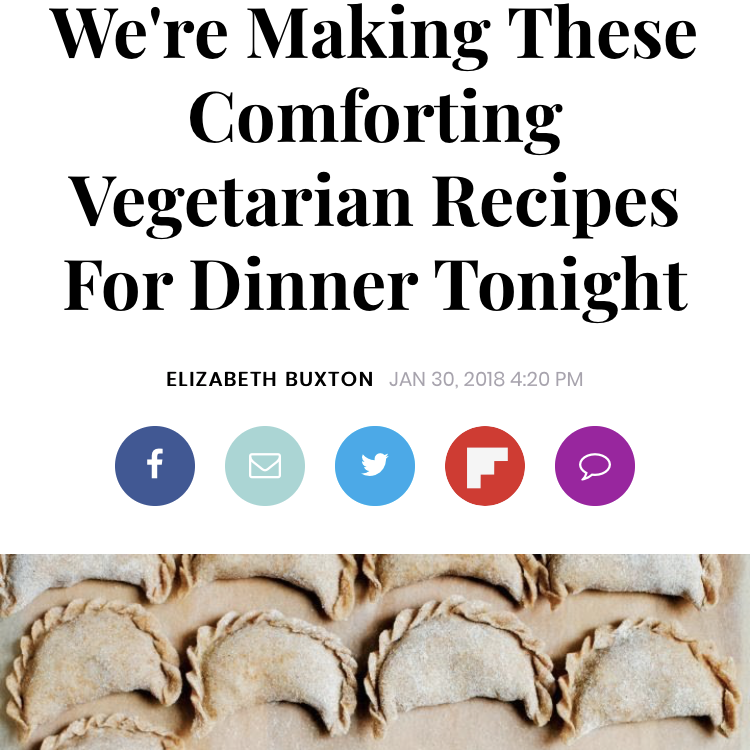 "Anya Kassoff is the co-founder (along with her daughter, Masha Davydova) of one of the most gorgeous plant-based blogs around, Golubka Kitchen. Her recipes are genius, creative twists on plant-based staples, and her new book, Simply Vibrant, is no exception. Here, she reinvents mayonnaise, making the classic sandwich spread out of apples (!!!) and probiotic-packed miso." "So when I picked up my copy of Simply Vibrant by the ladies of Golubka Kitchen, I breathed a deep sigh of relief. It’s full of these incredibly unique and healthy kinds of recipes. Recipes with color so vibrant your heart skips a beat. You’ve never seen oatmeal or ramen or a salad quite so beautiful. And you’ve probably never thought to combine some of the plants Anya combines." "The book is full of vibrant photographs of bright-colored plant-based fare, and the recipes are creative and beautiful. 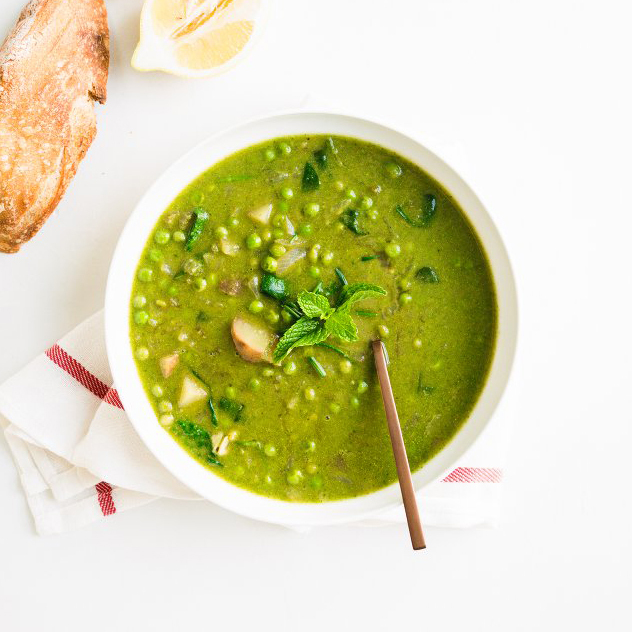 This spring vegetable chowder jumped out to both Alex and me, with its bright green color and comforting vibe. It’s full of spring vegetables: green peas, baby greens, chives, and mint. We were even able to use chives from our garden that are just starting to come up! The soup has a cozy, hearty and almost meaty flavor from cumin, coriander, and garlic, set off by the fresh herbs... Everyone in the family enjoyed it, and even little Larson couldn’t stop eating it." "This is the perfect recipe to welcome spring. It’s bright and lemony, a little nutty, and pairs perfectly with tender sweet peas and bitter greens." "The cookbook is just gorgeous, with lots of beautiful photos, seasonal, plant based recipes, many gluten free recipes, and decadent healthy treats. I especially love that there’s an emphasis on using up every part of something- in this recipe you use the herb stems and bean cooking liquid- for an extremely sustainable and delicious dish. She honors vegetables in the way there were meant to be experienced- as the star. There’s something for everyone in this book, and it’s already become a treasured and referenced cookbook on my shelf. I don’t say this lightly- I hardly own any cookbooks, but this is definitely a gem." "This one is from a cookbook I’ve been eagerly anticipating for months now. It’s Simply Vibrant written by the amazingly creative Anya of Golubka, one of my favourite blogs. Her new book, a follow up to The Vibrant Table, is just as the name suggests, electrically vibrant. Chopped full of simple, seasonal, and seriously mouthwatering dishes (which are all photographed so gorgeously by her daughter, Masha Davydova), Simply Vibrant is a plant lover’s dream come true. "These brownies come from Anya Kassoff (from the ever inspiring blog, Golubka Kitchen) and her daughter Masha Davydova (she takes all the stunning photographs! ), and their cookbook: Simply Vibrant. this is their second cookbook that focusses on plant-based, vegetarian meals spanning the day. Anya, like she does on her blog, makes her recipes so inviting not only with the beautiful photos that grace the pages, but the different flavors and textures she incorporates into each dish. " 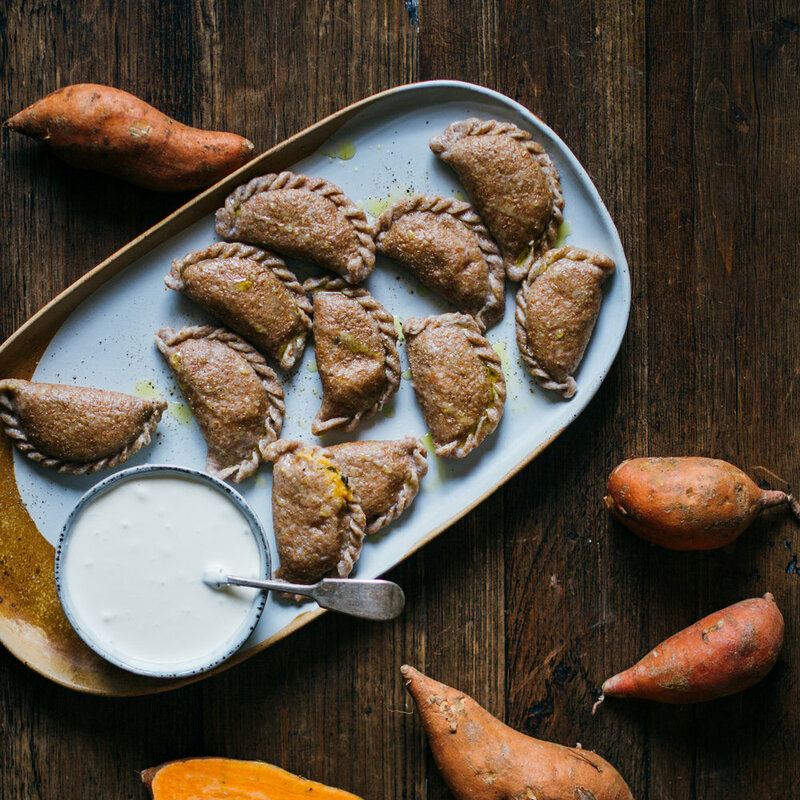 "It was hard to select what to cook first and I’ve choosen this white bean and sweet potato dumpling after a while of thinking. Dumplings (or I can call them “vareniki”) are food from my childhood and my mum made these for us very often! Her favourite fillings were mashed potatoes with caramelised onions and sautéed white cabbage. I was curious about the sweet potato filling and it didn’t backfire. I also would like to say that adding lime juice to the filling made it very fresh and neutralised sweetness of sweet potatoes a bit. I loved it!" "I had seen an earlier galley of Simply Vibrant, but I didn’t know how much I needed this dose of inspiration until the physical book showed up at my door. We’re in that deep, lingering last stretch of Winter, and I’m admittedly slipping into a staid routine with all of our meals. Anya’s style speaks to exactly what we’re all craving I think: seasonal shifts on international flavours, streamlined and intuitive cooking methods, and a nourishing plant-powered undercurrent that is present but not in-your-face." "When I was reading the cookbook in preparation for this post, I immediately centered in to this beautiful pasta recipe. First of all, I love pasta in all forms, so it was a no-brainer. But what really intrigued me was the sauce for this recipe. At first, I squinted at the ingredients to make sure they were right. Mustard? Smoked paprika? Sriracha?! I thought there was no way these flavors could work together. But when I actually made the sauce, I was beguiled by the beautifully smoky, savory, umami-rich flavor. I think you’ll absolutely love this recipe! "Simply Vibrant is not divided into chapters by seasons or time of the day, but into type of recipe: morning porridges and pancakes, wrap and rolls, fritters and veggie burgers, and so on. This makes so easy for the readers to find exactly what they’re craving for. The use of spices, vegetable, and grains is often surprising – as in the coriander millet porridge at page 33, the broccoli stem riceless risotto at page 155, or the upside-down plum cafe with autumn herbs at page 278, that I really hope to try as soon as possible. "Anya’s new cookbook is exactly as described, simply vibrant. She makes you feel confident that no matter what amount of fruits and veggies you have on hand, you can make a beautiful and satisfying meal. She encourages cooking with the seasons, and then shows you how. Each recipe is beautifully photographed by her daughter Masha, with pops of color from the produce highlighted in different parts of the seasons."